Some time ago, I gave Rust Monster readers a character sheet for and a sneak peek at my "forthcoming" home-brew campaign setting: Dark World. Well, I never promised it would be coming soon. /wink/ Although progress may be slow, the setting is progressing. Inspiration continues to filter through my over-worked brain, making its way arduously through the tangles of my fevered imagination toward a final product. What I have now looks little like what I had originally envisioned, being less inspired by Thundarr the Barbarian and more inspired by the likes of Lovecraft and C.A.S., by other games (see if you can guess which) and by my own weird sense of humor. Ooo, pretty! I like that invisible school. I went to one of those once myself. That is such a great map! The place names are very evocative. Well done! Any Balrogs in Shale Knot Pass? Sooo... Mind if I swipe a few of those names? I have the original Divine Right map myself, and have based as least one D&D game upon it as well. I might have missed it and apologies if I did - what tool did you use to make this map? @Cranky: No apologies are necessary - you haven't missed a thing. (Not here, at least. :P) I used Adobe Illustrator to make/modify a few of the map elements, and Photoshop to put it all together. Love the look of the Map. Nice Illustrative style, mixed with a healthy dose of Old School & Hexmapper. Suggestion: Change the colour of the Rivers to Blue. The Black could be interpreted as being borders? (I'm big on maps being a self-intuitive as possible. Question: Did you make the map with a custome template and the program Hexmapper? Or did you use Adobe Illustrator and crank it out by hand? 3. 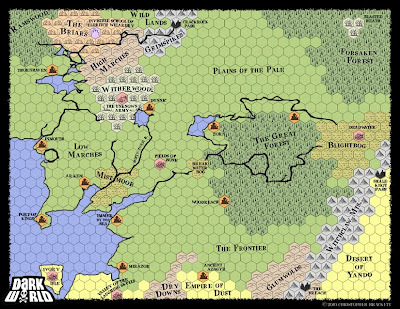 Have you seen "Thorfs" maps of Mystara? @ Gwarh/Chris: Glad you like it. I've never seen Thorf's maps, thanks for the link. In answer to your question, the hexes were from a scanned image (either of the old AD&D hex paper, or maybe the Champions hex paper), taken into either Illustrator or Flash (don't recall which) and converted to a vector image. The same was done with some of the illustrative elements (mountains, etc.). The rest was all created in Photoshop, and the vector images imported into that file. As to your suggestion, I'm still playing with the map colors. 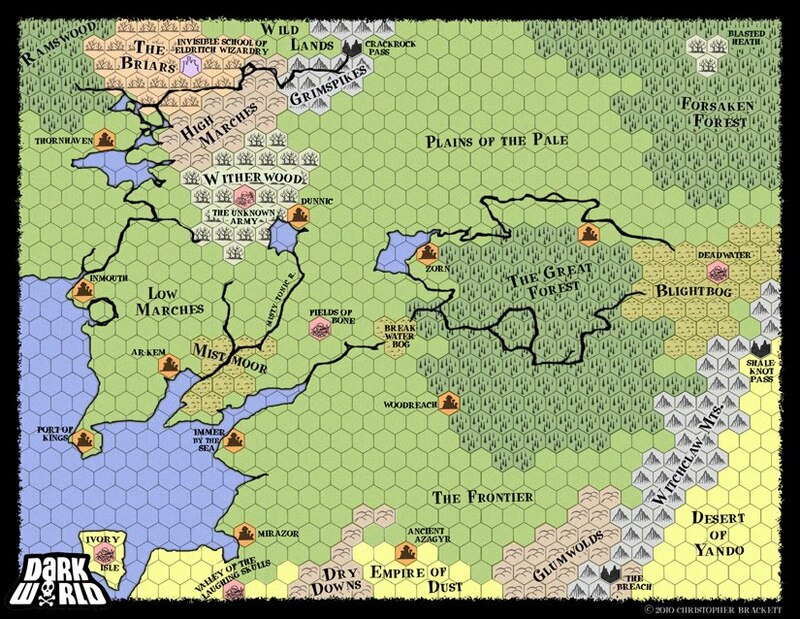 I really want an old-school style here - less polished than maps like those of Mystara in the Cyclopedia and the like. I'm currently exploring options like non-standard colors (purple forests, orange steppes, etc.) as well as going grayscale, or maybe even monotone. We'll see what happens - but I'll bear your feedback in mind.